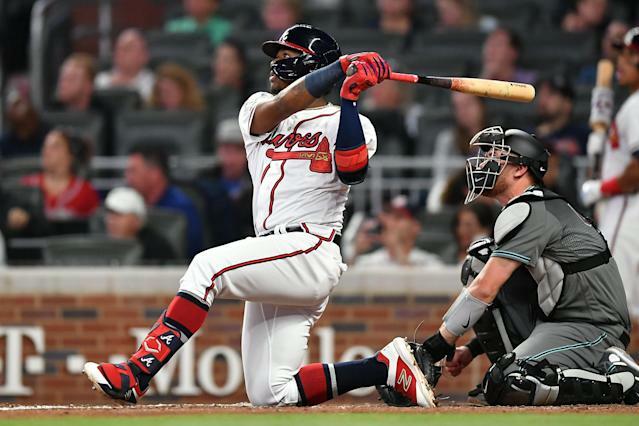 Atlanta Braves outfielder Ronald Acuña Jr. has quickly become one of Major League Baseball’s most entertaining players. The second-year sensation continued building that reputation during Tuesday’s game against the Arizona Diamondbacks, authoring a pair of buzzworthy moments that had baseball fans going from busting a gut laughing, to looking on with pure astonishment as he channeled his inner Adrián Beltré. The 21-year-old Acuña started his memorable night with some hilarious baserunning antics. He was the runner at first base when Johan Camargo grounded into a relatively easy 6-4-3 double play during the second inning. Realizing there was no chance to break up the double play, and also realizing he was in the line of fire as Arizona shortstop Nick Ahmed prepared to fire a fastball to first base, Acuña slid completely off the grid. We’ve seen some awkward slides before. Most of those were unintentionally entertaining. This one felt different. Even Acuña’s teammates couldn’t help but chuckle as he surrendered to the infield grass. While his second-inning slide was entertaining, Acuña’s fourth-inning home run was equally mesmerizing. Acuña went down to one knee to launch a monstrous solo home run against Arizona’s Robbie Ray. We’ve mentioned Beltré because he made homering from a knee into an art form. We can’t recall him hitting one quite that impressive though. Ronald Acuña Jr., you are one strong young man. Unfortunately for the Braves, his strength wasn’t enough to carry them to victory. Despite Acuña reaching base four times, the Braves lost the game 9-6.